What enabled many of the first Friends, as well as Quakers in our time, to live spiritually empowered, transforming lives? Our Life is Love: The Quaker Spiritual Journey describes ten essential elements of the Quaker spiritual journey, as experienced by the first Quakers and by Friends today. The book is intended to help Friends and other spiritual seekers explore our own experience and better understand how God, Christ, Spirit, the Light calls us into lives of faithfulness. It’s designed for both individuals and study groups. This book is the fruit of many years of prayer, research, teaching, and traveling among Friends. A Study Guide for Our Life is Love is available HERE. An excerpt from Our Life is Love is available HERE. Many blog posts on A Whole Heart (between 2012 and 2014) were first drafts for some of the sections of the book. The blog post The Fruit of Long Labor describes Marcelle’s process of learning, research, and writing. Our Life is Love is available for purchase from Inner Light Books in hardback, paperback, and ebook. If you are interested in ordering multiple copies of the paperback, with free shipping, Contact Us. Numerous meetings have organized study groups based on Our Life is Love, using a variety of different formats, some groups lasting a few weeks, others taking months to read and discuss the book together. “Many of us begin our Sundays at a gathering we call “Forum” which meets from 9:30 – 10:15 am before worship. Forums are worship-centered discussions, usually led by an individual or small group about a particular topic. They are designed to build community and to help those who attend prepare for meeting for worship. 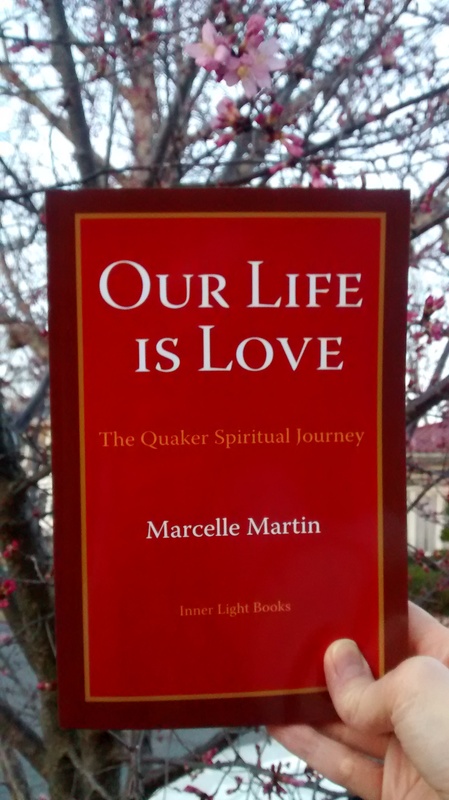 Starting in September of this year, we have dedicated the fourth forum of each month to exploring the Quaker spiritual journey through Marcelle Martin’s book, Our Life is Love. Each month, from September through June, we are exploring one of the ten elements of this journey that we’re on together by sharing our stories with one another and responding to the reflection questions that Marcelle raises up. We see it as an opportunity to deepen our connections to one another and to our Quaker heritage. Many Friends have copies of Marcelle’s book and prepare for each forum through reading and contemplation. Others come without having read the book, and all are welcome. The facilitator writes out the reflection questions so that everyone can easily see them. We begin with about five minutes of worship during which the reflection questions are read aloud. Then, we find a partner – ideally someone we don’t get to talk to very often. We take turns, about five minutes for each person, sharing what came up for us as we reflected on the reading and the questions. Afterward, we have a period of worship sharing. Friends share their response to the reading, to the reflection questions, and their own stories of how they have experienced the element of the journey that we are considering together. There has been tremendous richness in the sharing we’ve experienced so far. You can help this book to reach other people who could benefit from the wisdom of early Quakers and Friends in our time. Please pass the link for this page on to your friends. Organize a study group at your meeting or in your congregation. Write about this book on your blog. Write a review. Ask your bookstore to stock copies. Invite Marcelle to lead a workshop, do a book talk and signing, or speak at a forum. Contact her HERE. Below are links to book reviews of Our Life is Love: the Quaker Spiritual Journey. Review by Marty Grundy in the August 2016 issue of Friends Journal. I wholeheartedly recommend this book for any Friend or meeting that yearns for the heart of Quaker faith and practice, summed up here by paraphrasing William Penn: that we must be changed ourselves before we can change the world. Review by Ellen Michaud on March 2016 Quaker Books website. The brief but well-crafted stories of 33 early Quakers like Elizabeth Hooten and James Naylor evoke powerful, piercing images that offer concrete examples of spiritual journeys from which to extract valuable lessons, as do the 62 stories of more contemporary Quakers such as Richard Taylor, Eva Hermann, and Thomas Kelly. As a result, and particularly if one or another of its chapters is read in the meeting community and accompanied by reflection and discussion, Our Life is Love will help each of us recognize who we are as a people, where we’ve been, where we are, and—as Way opens—where we’re being led. Marcelle Martin has led workshops at retreat centers and Quaker meetings across the United States since 1996. She was the resident Quaker Studies teacher at Pendle Hill for four years, and a core teacher in the School of the Spirit program, The Way of Ministry and the Nurturing Faithfulness program currently offered at Woolman Hill retreat center. She is the author of the Pendle Hill pamphlets Invitation to a Deeper Communion and Holding One Another in the Light. In 2013 she was the Mullen Writing Fellow at Earlham School of Religion while working on her book. On her blog, A Whole Heart, she writes about spirituality today, taking inspiration from the past to help us find the courage to become all God has created us to be in our day. Marcelle travels to lead workshops, retreats, and conver­sations about the Quaker spiritual journey and many aspects of the spiritual life. She is following a leading of the Spirit to nurture the vitality of Friends meetings and other commun­ities by teaching practices that open people to the direct experience of God active within and among them.